When Steve Sashihara, co-founder and CEO of IT and management consulting firm Princeton Consultants, recalls the climate for intermodal shipping in 2009, he chuckles because "it was just so terrible." "There was a lot of capacity on the road and many shippers left intermodal for trucking because the carriers were almost giving service away just to keep their business going," Sashihara says. Today, shippers face a markedly different landscape. Shippers see a trucking sector that finds it hard to find drivers, and operates at essentially full capacity, resulting in reduced availability and higher prices. 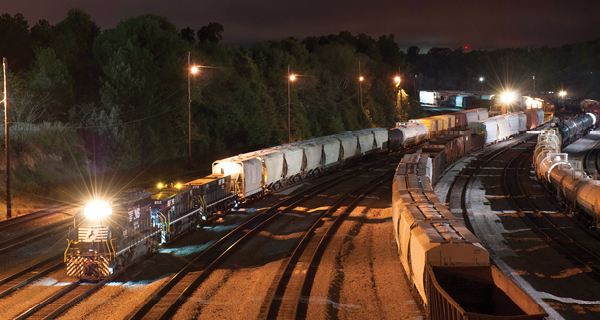 Consequently, logistics decision-makers are considering alternatives, and intermodal offers obvious appeal. Shippers tend to view intermodal as a lower-cost option to trucking and "in some ways that's still true," says Todd Tranausky, senior transportation analyst for freight transportation intelligence provider FTR. Trucking rates are about 10 percent higher than one year ago "at a minimum," he says. However, shippers should understand railroads are being "very aggressive" in their approach to pricing, he notes. "Intermodal is not as inexpensive as it used to be," Tranausky says. "If you were used to using intermodal five years ago, the rate quote you get today will be at a significantly higher price point." The market has dictated the increase in prices. "While truckers raised rates, railroads have not sat by and stayed content with their intermodal pricing," Tranausky says. "They're under pressure to make sure they follow truck rates up as much as they possibly can, especially as they face threats from declines of commodity groups, particularly coal. They need to be able to replace that revenue somehow."